This tower is 233 meters tall and is the world's highest commercial bungee jumping platform. Do you dare? 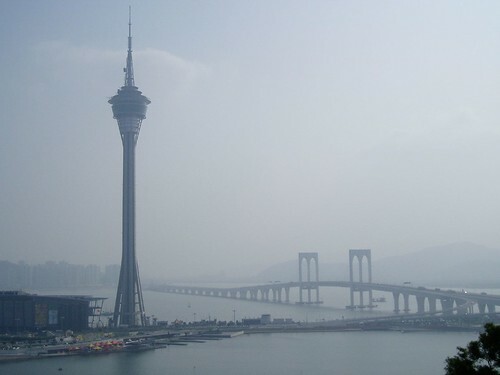 The jump platform at Macau Tower is a full 233 meters high, placing the inaugural jump at its December 2006 launch into the Guinness World Records. Hardy jumpers who make the leap experience about 4 to 5 seconds of freefall—at speeds of up to 200 kilometres per hour—before stretching the 50 meter bungee cord nearly four times its unloaded length and rebounding at approximately 30 meters above the ground. The tower uses a guide cable system, allowing bungee jumpers to safely experience a few rebounds before slowly landing onto a specially designed airbag. Pricing is MOP 1,088 (USD 135 / EUR 92), which includes a certificate, membership card and souvenir T-shirt.